Once you’ve set up your iCloud account, you will be prompted to set up iCloud email (or iCloud Mail as it’s called). If you used an email address that doesn’t end with @icloud.com to set up your Apple ID, you will need to create an email address ending with @icloud.com before you can use iCloud Mail. If you use an email address ending with @me.com or @mac.com you also have the option of adding @icloud.com. No matter which of these accounts you send mail from, you will receive all incoming mail to your @me.com, @iCloud.com or @mac.com straight to your iCloud Mail account. Go to Settings>iCloud>make sure Mail is switched on and follow the instructions for setting up. It’s really very simple. 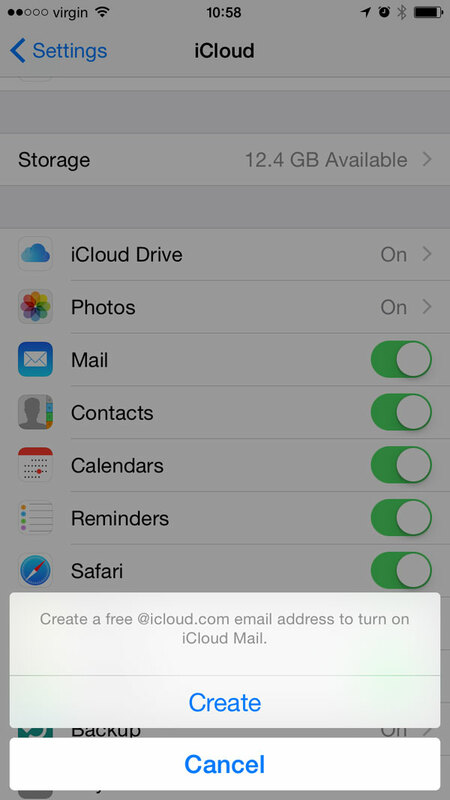 First you will be prompted to create a free @icloud.com email address to turn on iCloud Mail. Next, simply choose your email prefix address (the bit before @icloud.com). Go to the Apple Menu>System Preferences>iCloud>Mail and follow the instructions for setting up. Click the disclosure triangle to the left of your account to enable you to view your iCloud mail accounts in Outlook. You can also access iCloud Mail by going to www.cloud.com. This may seem obvious, but just in case anyone is struggling, open iCloud Mail on your device by going to Settings>iCloud>Mail and begin composing a new email. If you do have other mail addresses such as @me.com or @mac.com you might want to make sure you select your @icloud.com address. To do this tap on the Cc/Bcc field and select From>select your @icloud.com address. Finish your message and hit send. Select “Send new messages from” and choose your @icloud.com email address. As with your iCloud Account, Apple gives you the first 5GB of storage free. But this is to share between your iCloud email, your documents, your account information and all your app data. So as you can imagine it doesn’t tend to go very far. You can buy more storage from Apple. To do this on your device, go into Settings>iCloud>Storage>Change Storage Plan. If you want to do it on your Mac go to Apple menu>System Preferences>iCloud>iCloud>Manage. You can also manage your iCloud settings to manage which app data is being stored and backed up to iCloud. To do this on your device go to Settings>iCloud and switch on or off the apps you want iCloud to back up and Sync. For more information on managing storage, check out our iCloud page. For more information on setting up iCloud Email, check out Apple’s support page here. Maximum size of incoming and outgoing mail is 20MB (unless you are using MailDrop which allows up to 5GB). If you do exceed your limitations, you will receive a message saying your email has been placed in your Outbox because “the message sending failed because you exceeded your sending limit”. MailDrop essentially lets you send a preview or a link to download your file (it’s quite similar to sending a link in Dropbox or via WeTransfer.com or Yousendit.com). If you want to send large files, MailDrop lets you upload attachments or send links up to 5GB in size. The attachment link will be available for 30 days after you send it, so be sure to remind your received to download it before it expires. If you attempt to attach a document which is too large, you will be prompted “Do you want to deliver the attachments using Mail Drop?”. Simply agree, and the attachments will be uploaded via MailDrop. To add an attachment, click on the paperclip icon. To remove an attachment, click on the x icon.